Rated to work at depths to 328', the Black Molly 5 Dive Light from Bigblue is a useful accessory for image makers who work underwater. 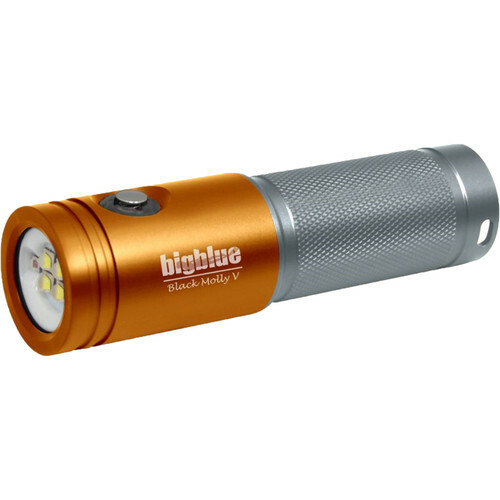 The light, offered here in orange and silver, features four brightness levels with a peak output of 2600 lumens, a beam angle of 120°, and a 150-lumen red light setting for focusing and night video work. A single illuminated push-button switch turns the light on/off and serves as a battery level indicator. Runtime with the 26650 battery freshly charged ranges from 2 to 20 hours, depending on output level. Made of anodized aluminum alloy with a tempered optical glass lens, the Black Molly 5 can be easily mounted onto a video rig with the included 1" ball or used hand-held.